Once again, it seems the stars of Anvil: The Story of Anvil are ready to be touring again. The movie drew Anvil out of obscurity, and now it seems the band are ready to relive their dreams. 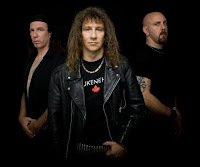 A greatest hits album, Monument of Metal: The Very Best of Anvil, comes out on September 27, and a good number of tour dates are scheduled in support. The shows kick off in Springfield, VA on October 19; expect the band in New York City at the Highline Ballroom on November 7. The full schedule is below.